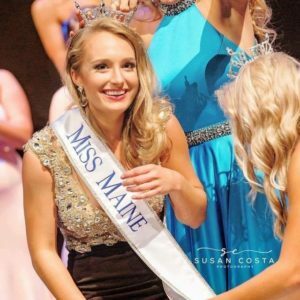 The Miss Maine Organization, the official state preliminary to Miss America, recently crowned Katherine “Katie” Elliott ’17 Miss Maine. In this role, the alumna from Scarborough, Maine, will spread a message encouraging civic engagement among women. She also will serve as goodwill ambassador to the Children’s Miracle Network, Miss America’s nonprofit partner. Elliott is gearing up to compete in the Miss America pageant in Atlantic City, N.J., next month (airing on ABC, September 10). A psychology major and political science minor at Wheaton, Elliott served in the college’s Student Government Association (SGA) during all four years as an undergraduate. Her first year at Wheaton, Elliott was elected class senator in the SGA, and by senior year she had worked her way up to president. “It was good for morality, and for the student body,” she said. Elliott credited Kate McCaffrey, vice president for student affairs and dean of students, for her success on the SGA, and as a student. The affection goes both ways. “It was a pleasure working with her and watching her grow as a leader. She has high expectations for herself and holds her peers to the same high standards,” McCaffrey said. In addition, McCaffrey noted Elliott’s efforts to boost awareness of mental health issues on campus. “She served as a student representative to help shape a strategic plan for mental health and wellness services, programming and education for students—much of which will continue to be implemented this academic year due to the work of the task force in which Katie was involved,” Kenny said. Elliott said she looks forward to the next chapter as Miss Maine (and possibly Miss America). She will spotlight issues such as low voter turnout and the lack of diversity (and competition) in political races—and most essentially, the small percentage of women running for government. Elliott said Wheaton has prepared her to answer challenging, curveball questions typical of pageants. Elliott has seen several academic benefits to pageants. Winning Miss Maine Outstanding Teen as a high schooler provided her with scholarship money to attend college. (She noted that Miss America gives out $16 million in scholarship money to women every year.) The pageants also gave her a platform to advocate for what she believes in, which has helped boost her confidence. Looking forward, Elliott—who interned at Sen. Susan Collins (R-Maine) office as a Wheaton student—plans to get involved in the 2018 gubernatorial races. She hopes to work on campaigns and supply expertise on how branding affects public opinion. She also someday wants to advocate for veterans. As an intern with Sen. Collins, she offered guidance on accessing services, particularly health care, to the large population of veterans in the state of Maine—and she hopes to continue with that work. Elliott hasn’t ruled out running for office someday herself. 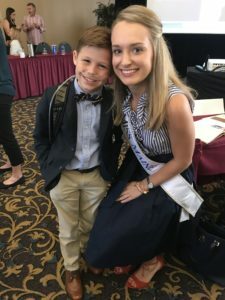 “In the future, I would be interested in running for office, but for now, my focus is connecting with people in the state and country; making a difference with kids with terminal illness; and encouraging girls to run for political office,” she said.